When World Cup Chief of Race Jimmy Hancock says “cool hat,” you know you’ve made the cut. For the record, Hancock said that to me back in ’99 or ’00. Another thing that made 1981 so special was that it was the return of World Cup skiing to Aspen. We’d hosted the races in the mid-1970s, only to lose our stake in the elite circuit during the 1976-77 drought. 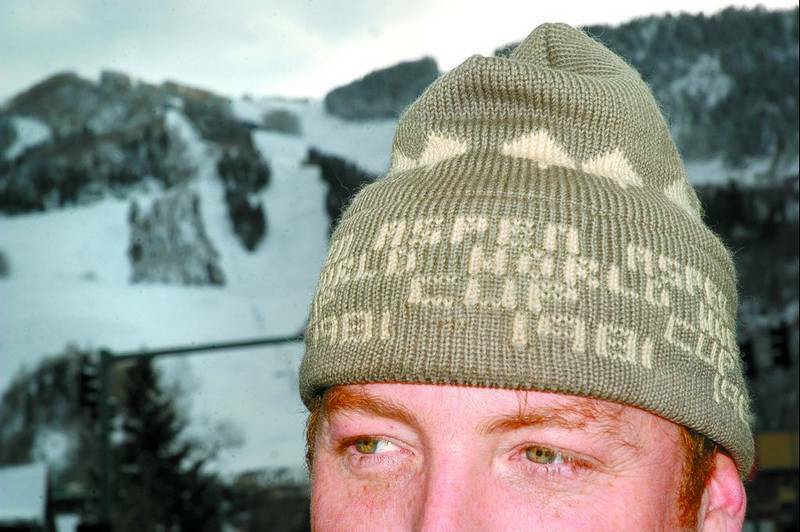 So in 1981, Aspen was celebrating its return.Willy Volckhausen, son of the original designer/knitter of the Aspen World Cup hat, Lulu Volckhausen, reckons there are less than 100 of the old gray-and-white caps still in circulation. “Every now and then, I see one,” Willy said. There were only a handful made that first year anyway, because no one knew how popular they would be. Over the years that followed, the wool Aspen World Cup hat became part of our FIS franchise. They are all great hats, but the fact they were made in such large quantities as to satiate status-hungry Aspenites means they have less cachet than their predecessors. My Aspen World Cup 1988 hat is a handsome piece, for example, but it has yet to bring me a single iota of adulation.